In a recent survey testing Americans’ abilities, only 17% of adults could find Afghanistan on a map. In comparison, Sweden scored highest and Mexico scored last in performing the same task. (In case you’re wondering, the U.S. scored just above Mexico.) Another study conducted showed that only 11% of those taking the survey were able to point to the U.S.A. on a map. Additionally, in spite of being threatened by Iraq on a regular basis, less than 15% of young Americans surveyed could locate Iraq on a map. In combination, these statistics indicate that some young people are in no way prepared to enter a global workforce. Surveys and interviews have shown geographical knowledge among Americans is low and is only getting worse. As of 2014, 73% of Americans couldn’t identify America on a map of America. If there’s any hope of improving this situation, we need to understand what geo-literacy is and what it entails. According to National Geographic, geo-literacy is “the ability to use geographic understanding and geographic reasoning to make decisions.” National Geographic highlights the importance of geography in our daily life, contending that we all use geo-literacy on a regular basis to make decisions about where to live, travel, visit, and more. This is why geography matters more than ever! …gain a deeper understanding of cultures around the world. Geography opens students’ minds and eyes to what people in other parts of the world live like. …understand basic physical systems that impact daily life. Learning about the terrain or physicality of a territory helps students understand why its inhabitants may prefer (or only have access to) certain modes of transportation over another. Teaching students about Americans and geography simultaneously aids in students’ understanding of both areas. …recognize the “where” of places and events. History truly comes alive for students when they can envision the places they’re studying! Instead of just reading about the oldest fort in your city, take your students on a tour so they can literally place their hands on it. If there are guided tours at a historical site, they may be staffed by people who are early residents of your city. …make more informed travel and housing decisions. Knowing a bit about your destination beforehand makes for a smoother travel plan. The same bit of knowledge can also help when making decisions about where to live. Teaching world geography to high school students doesn’t have to be something you dread! In fact, with a little preparation, it may come to be something you enjoy teaching. Assess your students. The first step to developing a well-rounded plan for homeschooling geography is to activate your students’ prior knowledge. Since you don’t have to cover concepts and material your students already know, assessing will also free you up to cover many more areas and ideas. Discuss the function of maps in your geography studies. A map is a map – or is it? Talk with your students about the different types of maps that exist and what roles the legend (especially a symbolic or theme-oriented one) and scale play. Then, calculate the distance between your city and another city, perhaps where a long-distance friend or family member lives. You could also determine the distance between your house and some famous landmarks. Talk about boundaries. It often takes many years for groups of people to agree on boundary lines. After discussing maps with your students, ask them how they think territories are determined. Brainstorm past events (wars, land contracts, etc.) that may have played a part in territory decisions. Discuss interrelated economies and currency conversion. Your students may find it interesting that the value of a dollar depends on where you are and what day it is since conversion rates can change daily. With just some construction paper and markers, you can create “currency.” As you explore new countries, you could have your students exchange $20 (or its equivalent) in each country. Sometimes they’ll gain money while at other times they’ll lose money. Start exploring! Once you’ve established a baseline and have discussed the background information, you’re ready for an amazing journey that spans the globe. Be sure to take some free virtual field trips along the way! Also, students relate well to their peers. Teaching them about life in other countries is certainly helpful, but helping them relate to other students will go a very long way in retaining geographical information. To facilitate this, consider finding a worldwide penpal for your student. So, why do we need geography? The reasons are endless! Not only does teaching geography help students learn more about different places around the world, but it also assists in understanding history. 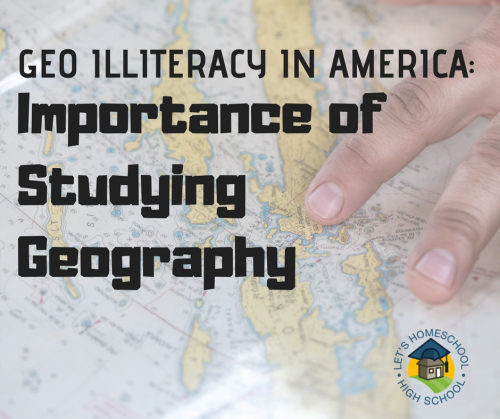 If you don’t feel capable of teaching this valuable topic, there are teaching resources out there that can help you since having a solid geo-literacy foundation is important for your students. Tasha has been writing for over a decade now and enjoys blogging about various topics, from kids crafts to homeschooling in general. She’s been homeschooling for over 14 years and has used every style of homeschooling out there, from unschooling to traditional textbooks and everything in between. She serves as a mentor to other homeschooling moms and works hard to juggle working from home, homeschooling, and part-time work outside the home. She’s a mom to 5 and feels like she’s got this multitasking thing down pat.